← So today I drove an electric car. Driving a Lamborghini Gallardo Like a Boss?? Meeting your heroes is always a bad idea. Because your expectations are so high, you almost always end up disappointed. You dream of the day you meet Harrison Ford for example, imagining meeting Indiana Jones, and end up seeing this 60+ year old guy, who is just a normal guy. This leaves you with a feeling of regret, as you pictured seeing you hero, but you actually saw a man. The same can be applied to cars. Since I was young, I was always a big fan of Lamborghinis. The Murcielago was the car of my dreams. Then the Gallardo came out and I worshipped it. Seriously, for almost 2 years, my mobile ringtone was the sound of that wonderful V10 revving. With each new version I kept defending it, arguing that it was still a Lamborghini, and a magical one at that. I just would not hear the claim that this was in fact, a heavily disguised Audi. And then that magical day came. 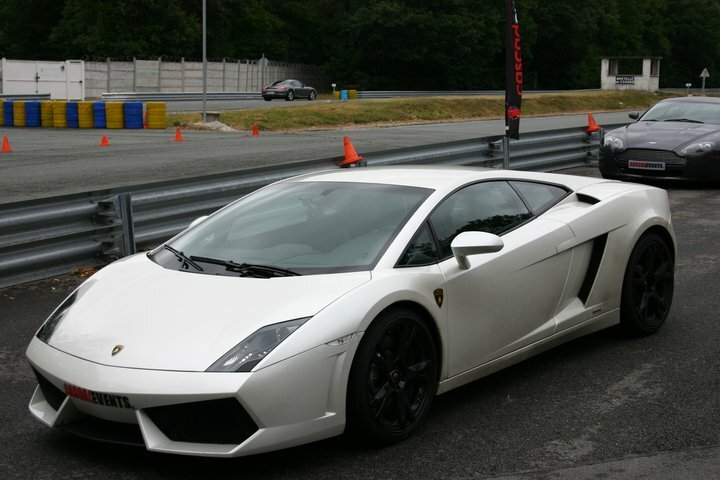 For my birthday, my parents got me one of those track day experiences, in – you guessed it- a Lamborghini Gallardo. And not just any old Gallardo at that, but the LP560-4, one of the best versions! I was so excited, and almost feared the experience. Was I worthy enough to drive it? Would I make a fool of myself and stall? Was I going to spin it and end up in a hundred grand worth fireball of aluminium und carbon fibre? How I was scared. Then I woke up one morning, and it started to rain. I still went there. I saw the car I was going to drive being taken around the track by other lucky people such as myself. It was a white one. Some were good, revving the thing like it was a game of who could reach the highest without blowing the thing up. Others, like myself presumably, were cautious, never going over 2,000rpm. My heart was in my throat. I mean, I drive an everyday car of 112bhp, and here I was, about to drive a 560bhp car capable of over 180mph. Crazy stuff I tell you. I got in, and first sign or relief, it was en E-gear, so no risk of stalling. I got the usual briefing, and then we set of. Sort of. You see, when you press the gas pedal in a car of this power, you don’t smash your foot down if you have any common sense. You try and feel the power. If you’re scared, like I was, well, you push millimetre by millimetre, until you start moving, freeze because you realise what you are doing, then continue. We left the pits and went on the track. First impression, this is a big car! Very wide. The track almost felt too small for it. Second impression, hang on, where is the noise? At normal speeds there is no drama, no noise, no tremors. Am I in the Lambo, or did I get in the wrong car? We did a lap fairly slowly, to get a feel for the car. Then I start building up speed. And mash my foot on the gas pedal. It is fast, and yes there is a lot of sound. It is clichéd, but it is musical. It does feel like you have the London Symphony Orchestra playing Flight of the Valkyries in the back. You are pushed back each time your foot goes forward. And when you brake? You are thrust forward like a NYPD badge in a second rate cop movie. Add to that some very precise steering and it is a genuine pleasure to drive. In the back of my head I kept feeling a bit disappointed. You see, everyday I drive a Mk2 Golf GTI that is now 21 years old. Every morning when I turn the key, I am greeted with a bark here, tremors all over the place, and sometimes huge roars of discontent. All six senses are alive and enjoying it. In the Lamborghini, it all felt too clean and clinical. It was almost comfortable (it was a track though) and quiet if you stayed under 3,000rpm (given the fact this was a track experience thing, it was rare that we were encouraged to go over 4,000rpm, understandable but a pity). Yes, there is noise, yes there is speed and precision. But it felt hard to feel the excitement and thoroughly enjoy the experience of driving it. Yes I was smiling all the time and it does rate as one of my best experiences, but I kept feeling disillusioned. This could also be due to the fact I was driving a hundred grand car and like hell I did not want to spin it (thank you 4WD I must say), so I did not really push it. Though I have to say, even though I felt that way, there was a huge flow of adrenaline through my body. No doubt, if I had less restraints, and a longer, wider track, I would have loved the car to bits, but on that day, on that track, I loved the experience, and thinking about it only really like the car. I hate to say, but I now do understand some of the criticisms on the car. I still like it though, less as a dream car, but more as an everyday sort of car. Which I guess is what it was designed for. For real sensations of fear and adrenaline, the car to drive must be the Murcielago. Unless it’s another case of not meeting your heroes. This entry was posted in Car reviews and tagged gallardo, lamborghini, murcielago, track. Bookmark the permalink. 3 Responses to Driving a Lamborghini Gallardo Like a Boss? ?